Only a short time ago, many agricultural professionals were optimistic Illinois would somehow be “spared” the incidents of off-target damage caused by dicamba that continue to plague several states to our south. The recent preponderance of evidence (observations made traveling the state, stories on social media, an increasing number of pesticide misuse complaints filed with the Illinois Department of Agriculture (IDOA), etc. ), suggests otherwise. 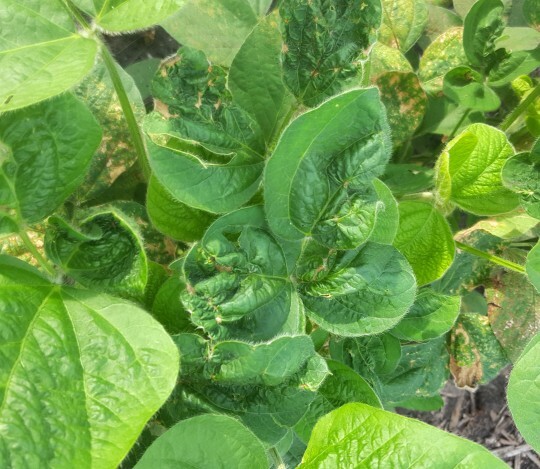 Instances of soybean demonstrating symptoms of exposure to dicamba have greatly increased over the past two weeks and it’s nearly certain the number of affected acres will continue to rise. To estimate the extent of this using the number of complaints filed with the IDOA as the sole metric would be to grossly underestimate the current reality. Some might be surprised to learn that instances of soybean exposure to dicamba have been an annual occurrence in Illinois since dicamba was first commercialized almost 50 years ago. One of the first experiments that described soybean’s sensitivity to dicamba was conducted by Dr. Loyd Wax at the University of Illinois in 1966–19671. 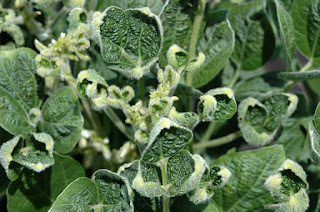 The stated objective of the experiments “…was to determine the response of soybeans to soil and foliar applications of dicamba, picloram, and 2,4-D to assess the potential hazard of using these herbicides in crops in rotation with soybean and in areas adjacent to soybean fields.” The symptoms of soybean exposure to dicamba described by these researchers 50 years ago are nearly identical to those currently being observed. The widespread adoption of glyphosate-resistant corn hybrids in Illinois during the first decade of the 21st century was accompanied by a decrease in dicamba use in corn, resulting in relatively few complaints of soybean exposure during the last 10 years. With more dicamba currently being applied, it’s not surprising the instances of soybean exposure have increased. Whether applied in corn or dicamba-resistant soybean, the fact remains that few dicot species in the Illinois landscape are more sensitive to dicamba than soybean. While the symptoms of exposure to dicamba are apparent, identifying how the exposure occurred is not always obvious. Speculations and "explanations" from some industry personnel have included almost everything except the Russians (stay tuned…that one might be next). Soybean’s extreme sensitivity to dicamba sometimes complicates accurately identifying the source of exposure. 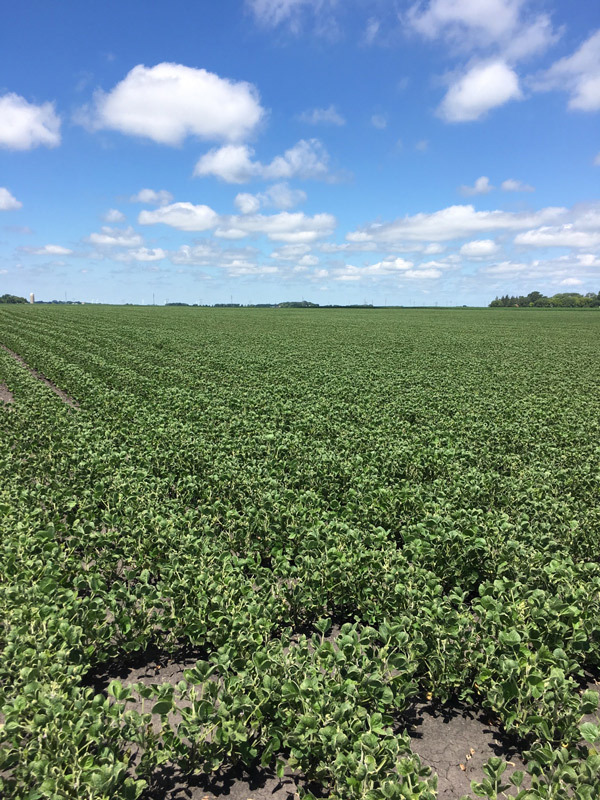 Recent research published by Dr. Kevin Bradley, weed scientist at the University of Missouri, indicated symptoms of exposure to dicamba could be induced at 1/20,000 of a 1x (0.5 lb ae/acre) field use rate. Additionally, symptoms generally do not develop immediately after exposure; we have observed instances where 21 days elapsed between exposure and symptom development. This route of exposure might be the easiest to identify based on field observations. Symptoms are usually most pronounced along the edge of the field adjacent to the drift source, and lessen as the distance from the source increases (Figure 3). Remember, the symptoms of exposure to dicamba depend largely on the dose. 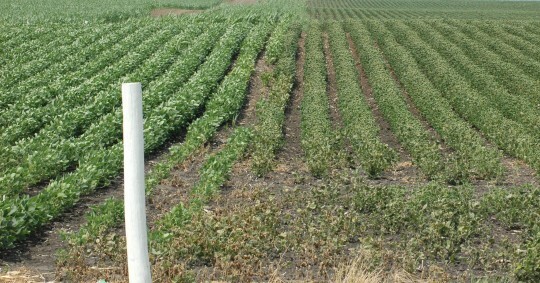 Symptoms are different on soybean directly sprayed with dicamba (often dead plants) compared with soybean exposed to a very low concentration (leaf cupping, etc.) farther from the source. Exposure from physical drift has been observed this year, but it does not appear to account for the majority of off-target exposure instances to date. These symptoms are often most pronounced around the perimeter of the field and along the edge where the applicator began spraying the remainder of the field. Symptoms often become less pronounced as the sprayer moves farther across the field away from the side where the application began (Figure 4). Contamination has been touted by some as an explanation for cupping of Liberty Link varieties, but it seems odd that it hasn’t been mentioned much as an explanation for cupping of Roundup Ready varieties. The volatility of a herbicide (i.e., tendency to change from a liquid to a gas) is a function of several factors related to the formulation of the herbicide and to prevailing environmental conditions. Vapor pressure is a measure of the tendency of a herbicide to volatilize. As the vapor pressure of a herbicide increases, the potential for volatility also increases. Volatility tends to increase as soil moisture and temperature increase. As soil moisture decreases, the amount of herbicide adsorbed to soil colloids can increase and reduce the amount of herbicide available to volatilize. All commercially-available formulations of dicamba have the potential to volatilize. Small droplets can remain suspended in the air when pesticides are applied during temperature inversion conditions. These particles then move out of the target area when winds begin to move the following morning. Where and how far they move depends primarily on wind direction and speed. Labels of dicamba-containing products approved for in-crop application to dicamba-resistant soybean restrict applications during temperature inversions. Some have speculated applications made at night (when inversions occur) have been responsible for off-target damage, but does anyone have actual data on how many acres are treated when headlights are needed on the applicators? There has been much conversation about leaf symptoms that likely were not caused by exposure to dicamba. As mentioned previously, symptoms of dicamba exposure can vary according to the dose of exposure and stage of soybean development. However, the symptoms of low-dose exposure tend to be fairly consistent. 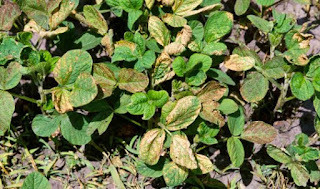 Can other herbicides cause leaf distortions? Yes, but these symptoms are different from those caused by dicamba. 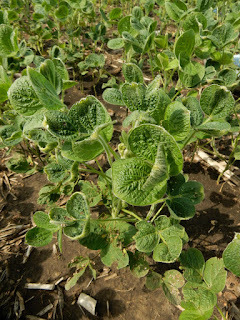 Foliar-applied PPO inhibitors can cause leaf distortions, but the degree of "cupping" is generally much less than that caused by dicamba and the symptoms appear on leaves treated with the application (Figure 5). 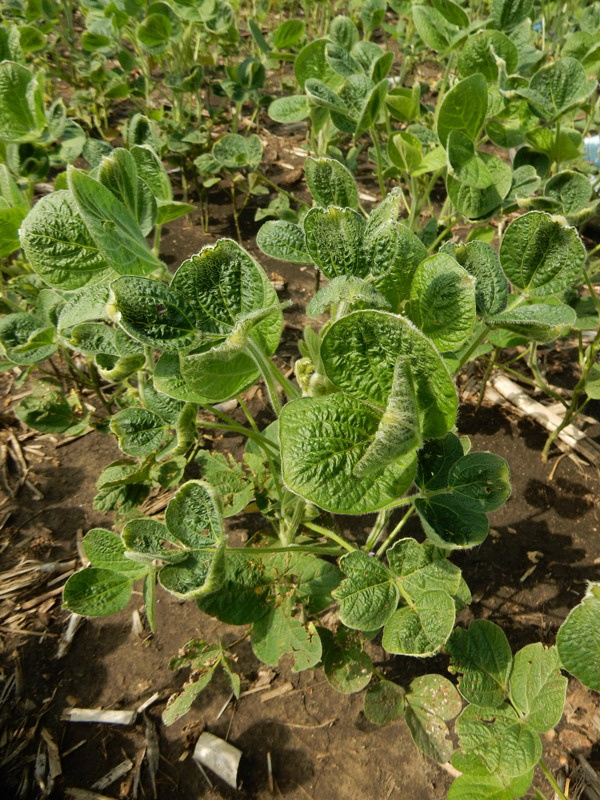 In contrast, cupping caused by dicamba is generally seen on leaves that emerge after the exposure occurred. We also have observed distorted leaves following POST application of soil-residual herbicides (Figure 6), but these symptoms are very different from those caused by dicamba. 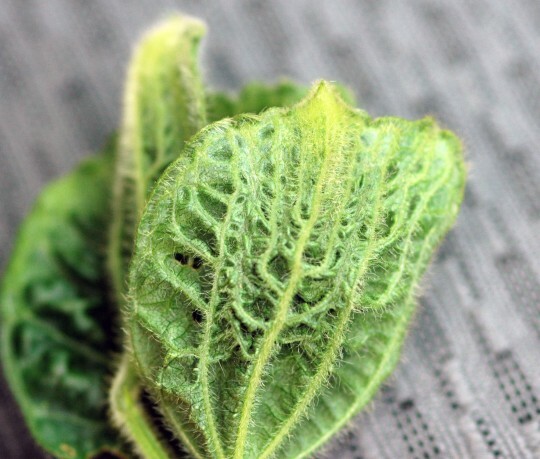 If cupped soybean plants were actually exposed to dicamba, will yield be adversely effected? The answer is that it is absolutely NOT possible at this point of the season to predict whether or not yield will be impacted. 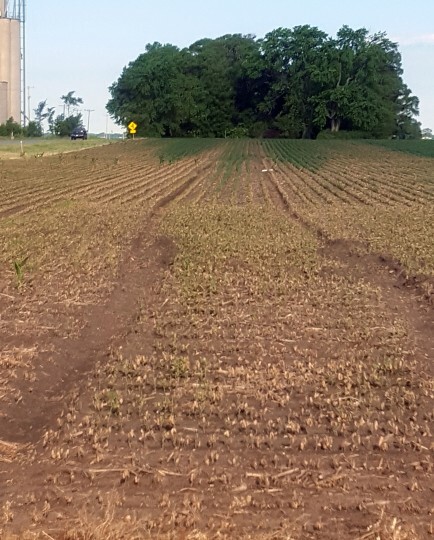 Published literature suggests this injury does not always result in soybean yield loss, but several factors are involved in determining if yield loss will occur. 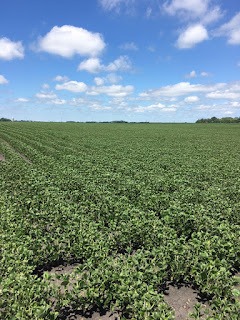 In particular, soybean growth stage at the time of exposure, dosage of exposure, and growing conditions for the remainder of the growing season are important factors that determine if yield loss does or does not occur. Much of the available literature suggests that if minor exposure occurs during early vegetative development, yield loss is less likely to occur than if exposure occurs when soybean have entered reproductive development. However, there are no data that describe yield effects on soybean exposed to dicamba more than once. I have attempted to describe the current situation in Illinois as accurately as possible, and to provide data-derived information related to soybean exposure to dicamba. As mentioned previously, soybean injury from dicamba has occurred each year in Illinois since the product was first commercialized. However, the response of some individuals from companies who market formulations approved for use in dicamba-resistant varieties has been unlike anything I’ve experienced during my 24-year tenure at the University of Illinois. Some comments heard from the field, social media, and industry are, in my opinion, quite troubling. "Only a negligible percentage of soybean acres are affected"
I doubt anyone has completely accurate data on the actual number of soybean acres that have been impacted by dicamba. Even if those data support the aforementioned statement, I haven’t spoken with many farmers who consider themselves or their acres as “negligible.” Merely counting official reports filed with the IDOA does not accurately reflect the extent of acres impacted. "Thoroughly investigate before drawing conclusions"
Excellent advice, especially when followed. Without question, there have been instances of symptom misidentification. I attempted to describe some of these in this article. However, it seems that other factors are repeatedly being mentioned as able to cause leaf cupping. Environmental conditions are frequently mentioned as inducing leaf cupping, yet I cannot find any peer-reviewed literature that specify or describe these conditions. If these conditions exist, one would speculate they could be replicated under controlled conditions to confirm their impact on symptom development. Also curious to me is that I have yet to see or have anyone report cupping of dicamba-resistant varieties. Are these varieties somehow immune to these environmental conditions? "The instances of volatility likely are due to applying older, non-approved formulations"
Again I ask, where are the data that indicate older formulations are being applied? If we should "thoroughly investigate before drawing conclusions," it seems premature to me to conclude the instances of volatility are wholly attributable to older dicamba formulations. Much discussion has been made about the newer formulations that are purportedly lower volatility formulations. These statements will have to be taken at face value, as I am aware of only one university that has evaluated volatility of only one commercial formulation. Please keep in mind that low volatility is not the same as no volatility. The new formulations are still volatile, albeit less volatile than older formulations. Symptoms in many affected fields do NOT follow patterns associated with physical drift or contaminated application equipment, and exposure though volatility remains a very possible source of exposure. "It is unlikely yield will be reduced. You might even see a yield increase." When dicamba is applied in a state that grows soybean, the occurrence of off-target symptoms is not a question of "if,", but rather "scale." Some suggest the solution is to plant all soybean acres to dicamba-resistant varieties. That might solve issues associated with soybean, but would likely increase the incidents of damage to other dicot species across the Illinois landscape. Wax LM, Knuth LA, Slife FW (1969) Response of soybean to 2,4-D, dicamba, and picloram. Weed Sci 17:388–393.